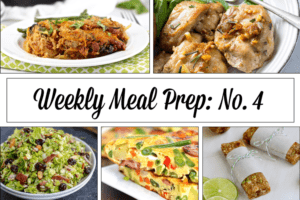 It’s time to get your prep on with Weekly Meal Prep Menu: No. 4 ! Hey there! Welcome to the Weekly Meal Prep series where each week we feature 2 entrees, 1 breakfast, 1 salad and 1 snack or treat (and sometimes, a bonus recipe). 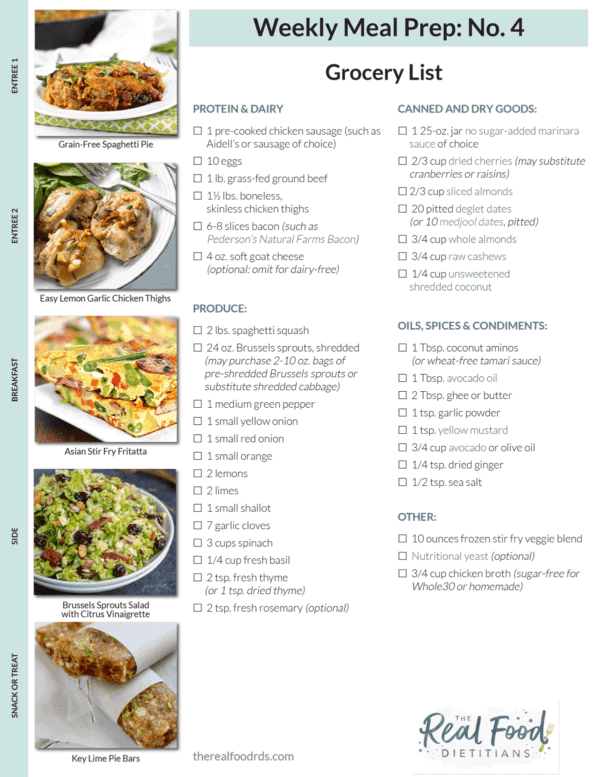 Our Weekly Meal Plan Menus are designed to serve 4 people – or fewer if you don’t mind leftovers. This won’t be enough to feed you or your family for the entire week but it’s enough to put a good dent in the week. Feel free to add additional recipes or staple items like hard-boiled eggs, fresh fruit, cut veggies, tossed green salads, salad dressings and more as your time (and energy!) allows. To get the recipes, just click the image or link to get the printable recipe. You’ll find the grocery list after the recipes – just click the link below the photo to download and print. 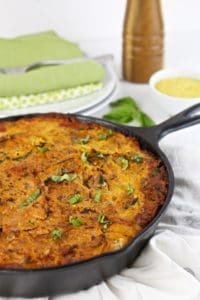 Grain-free Spaghetti Pie – Comfort gets a serious health upgrade with this Whole30-friendly featuring spaghetti squash for added nutrients and fiber. Resist the urge to gobble it up right out of the oven because like most saucy Italian dishes it’s better the next day! We totally recommend getting your hands on a big cast iron skillet because it will change your culinary game. For this recipe, a cast iron skillet means you can brown the meat in the pan then add the remaining ingredients and just pop it all in the oven. This 12-inch pre-seasoned cast iron skillet from Lodge is a kitchen workhorse – and perfect for the next recipe, too! 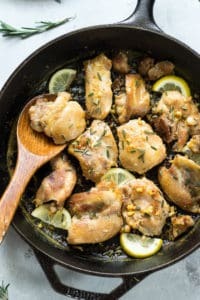 Easy Lemon Garlic Chicken Thighs (from Paleo Running Momma) – Warning: This recipe may become habit forming! A great alternative to plain baked chicken, you’ll want to put these on everything from salads to sammies this week. 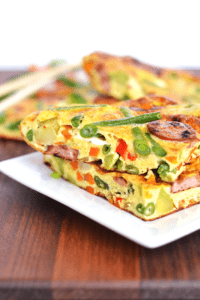 Asian Stir Fry Frittata (from Little Bits Of) – Leave it to our blogger bestie, Kelsey, to marry two totally different meals into one fabulous dish! Packed with veggies and protein, this is a great way to change things up in the morning and stay satisfied all morning long. Serve with sliced oranges or grapefruit for a sweet and savory combo. 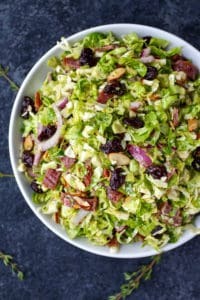 Brussels Sprouts Salad with Citrus Vinaigrette – Even if you’re not 100% in love with Brussels sprouts, you need to try this salad. It’s a great way to get more antioxidants and more cancer-preventing phytonutrients. It also holds up well in the fridge for a few days unlike leafy greens that get soggy once you’ve added the dressing. If you still need convincing…there’s bacon in there too. ‘Nuff said. Key Lime Pie Energy Bars – Here’s a zippy twist on a homemade Larabar! 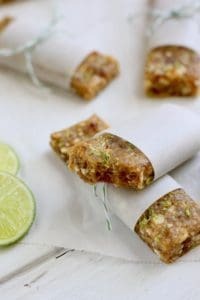 Made with just dates, nuts, fresh lime and a pinch of salt these energy bars are simple to make and even easier to love. Start your prep session by baking the spaghetti squash according to the directions for the Grain-free Spaghetti Pie. While the squash is baking, brown the ground beef and set aside until ready to proceed with the rest of the recipe. Once the ground beef is cooked you can switch gears to the Asian Stir Fry Frittata as this requires you to pop it under the broiler for just a few minutes (which should be right about the time you’re pulling the squash from the oven). After the frittata is done, start the Lemon-Garlic Chicken Thighs. Finally, get out the food processor to shred the Brussels sprouts for the Brussels Sprouts Salad with Citrus Vinaigrette (if you didn’t buy them already shredded) and make the Key Lime Protein Bars. Still not sure where to begin?! Check out our Top 10 Meal Prepping Tips here. We often carve out time for a mid-week meal prep to carry us though the weekend. The same ‘rules’ apply here – 5 recipes and 1-2 hours max in the kitchen. Even if you can’t pull off a full prep, making just 2 recipes can go a long way toward saving your sanity in the second half of the week. Don’t forget to take some snaps of your meal prep! Hashtag your meal prep photos #mealprepseries on Instagram so that we can see all of your delicious meal prep photos!